Italy indeed has it all: architectural marvels like the Leaning Tower of Pisa, the priceless artistic legacy of geniuses like Raphael, the chance to touch history just about anywhere in Rome and it’s inner sacred jewel - the Vatican, the world’s most romantic city floating on water - Venice, incredible wines, and picture-perfect coasts. Sounds like a dream-come-true vacation destination, doesn’t it? Well, it is! Discover its splendors with our tour to Italy. As versatile as Italy actually is, it’s surprising how incredibly inspiring are its cities, each in its own completely different yet charming way. 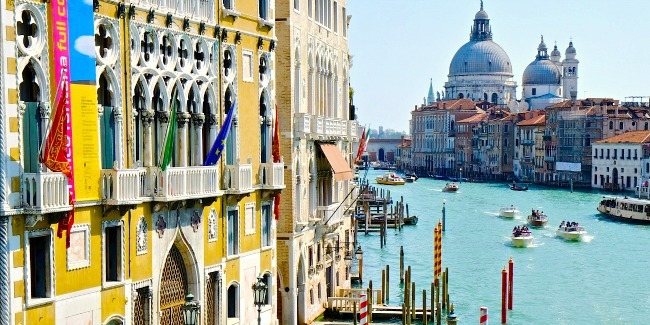 The place that will surely steal your heart from first sight during your tour to Italy is Venice. The uniqueness of this city, set on more than one hundred petite islands that intertwine with over 400 bridges and connect with gondolas smoothly swaying incalculable canals, is indescribable. Its time-stopping pace and romantic atmosphere leave no one half-hearted, embracing each with the purring sounds of traditional Italian music. And the city’s intriguing and heart-trembling symbols, Venetian carnival masks, adorn it with a pinch of magic making its beautiful Piazzas, basilicas and landmarks scintillate even brighter. A major highlight of Venice is Burano. The colorful buildings of this island make it one of the sunniest and positive places on Earth. The neighboring Murano Island renown for its exquisite glass-making tradition is also a must-see during a tour of Venice. As you make your way south to the Tuscany region, inhale the beauty of the incredible surroundings of Florence, that has given the world treasures of the Renaissance. The city has preserved the best that was gifted by the talents of the 14th century: gorgeous fortified palaces, the striking Florence Cathedral with the tiled dome by Brunelleschi, the Baboli Gardens rich in statues and the top-notch art museums. During your tour to Italy visit galleries in Florence, which are set in breathtaking palazzos and hold the relics of the Renaissance era, as such “David” by Michelangelo is housed in the Accademia Gallery, while the Uffizi Gallery displays Sandro Botticelli’s “The Birth of Venus” and Leonardo da Vinci’s “Annunciation”. And the surprises don’t stop at that! Only about an hour ride from Florence and you’re looking at the most recognized symbol of the country and an unmissable stop during an Italy tour - the Leaning Tower of Pisa. The 8-storey white marble bell tower, constructed in the 12th century is a miracle of engineering and one of the tallest buildings of its time. Although the biggest part of the tower’s charm is its tilt, not all know that it occurred as a result of the unknown architect's miscalculation and mistake, but it nevertheless impeccably completes the Piazza dei Miracoli cathedral complex. Rome - the provenance that so greatly influenced the world with its invaluable contribution to the development of modern life gifts plenty to discover. During your tour to Rome discover its ancient ruins from the Colosseum, Pantheon and the Roman Forum to the cobblestone streets, or go down to see the many remnants of the city's glorious past hidden below the groundwork of practically every central building in Rome. Its art heritage can excite as well, with the legendary Trevi Fountain and numerous galleries decorating the city with an enlightening vibe. Yet the beating heart of Rome and its sovereign spiritual center is what’s really unmissable. The Vatican keeps many secrets in its treasure troves such as the rooms frescoed by Raphael and the ceiling of the Sistine Chapel painted by Michelangelo. Home of the Pope, the Holy See boasts other sights worth seeing like St. Peter’s Basilica and the palaces of the Palazzo Apostolico Vaticano complex. Italia Bella - an unmatched manifold beauty, the motherland of pizza and delicious wines, the home of world’s greatest artists, and the Venus goddess of dream vacations. Explore its splendors with the new tour to Italy by Firebird and extend the pleasant holiday to Naples or the sunny Amalfi coast.